The MicroBooNE detector is an important step towards the construction of large scale LAr TPC detectors for the future long and short baseline neutrino programs. 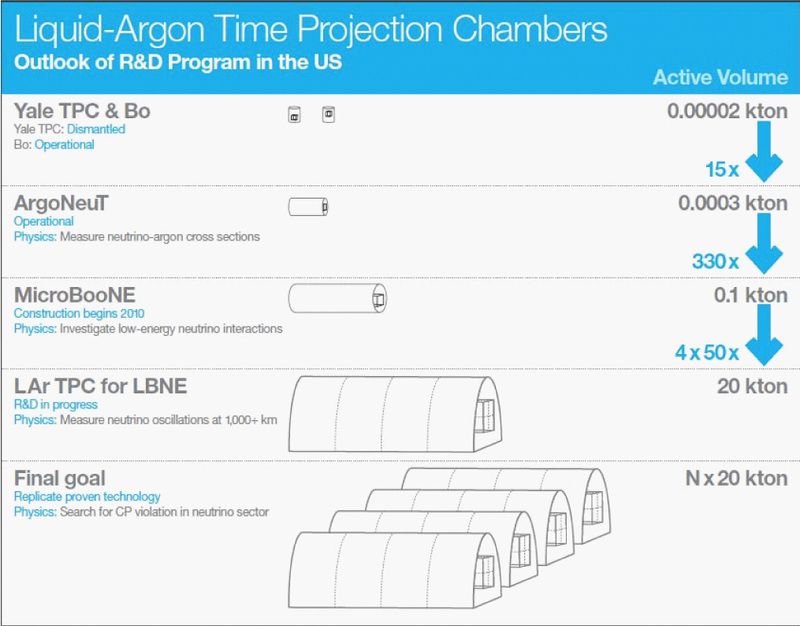 As shown below, this R&D path includes: small LAr TPC prototypes at Fermilab and Yale, the Materials Test Stand (MTS) and the Liquid Argon Purity Demonstrator (LAPD) at Fermilab, ArgoNeuT (a small liquid argon TPC that ran in the NuMI beam line), LArIAT (a LAr TPC testbeam experiment), and MicroBooNE. Various members of MicroBooNE participate in one or more of these activities as we work towards the realization of very large 10-kton-scale LAr TPC modules for DUNE.